We live in a connected world and the computers we used as kids are not the same anymore. Those machines are not just omnipresent, they are interconnected. The internet is not just about sending emails, making excel presentations, or compiling information any more. We have come a long way since the inception of Internet. Now, the World Wide Web controls everything – from managing social media accounts to making electronic transactions to tracking online purchases. Today, billions of devices are connected to the Internet. Almost everything today that powers our modern-day civilization like communication, commerce and infrastructure are connected by a centralized network of networks. However, with every big technological innovation – no matter how big or small – come unforeseen risks. The cyber domain is not without its weaknesses and in this case, it’s security. The cyber space has become the single greatest emerging threat in the 21st century, turning cyber security into one of the biggest concerns of the digital era. Fears over cyber security and ever increasing threats continuously compromise our notions of privacy. Antivirus programs play a crucial role in protecting our personal data and stand in between the cyber criminals and our computer systems. Not only they protect our machines from emerging threats but also eliminate the existing threats to the system. And when it comes to antivirus programs, Norton and Avast are the two big names in the cyber security space. We pit the two antivirus companies against each other to see who’s the winner here. What began as an artificial-intelligence-focused project, has now become one of the biggest names in the cyber security industry. With an enterprise-level portfolio of award-winning antivirus products and top-notch cyber intelligence network, Symantec Corporation aims to protect millions of customers both individuals and businesses from all kinds of security threats. Norton Antivirus is the flagship product and one of the largest providers of antivirus products under the ownership of Symantec. Norton is an industry-standard antivirus suite of antivirus programs and software utilities that sells its products under the name of Symantec Corporation. Headquartered in Mountain View, California, Symantec is a global cybersecurity company valued at over $11 billion. Founded by Eduard Kučera and Pavel Baudiš, Avast is a leading cyber security company headquartered in Prague, Czech Republic. Originally known as Alwil, the company owes its name to “AntiVirus Advanced Set”, the original security program, but later named after the company’s popular antivirus program called Avast. Avast has a sizable portfolio of a long line of antivirus programs along with privacy and performance tools and it’s still growing. Now protecting over 400 million devices globally, Avast stand amongst the biggest antivirus software vendors in the world. The company incorporates advanced and next-generation security technologies to fight against cyber crimes in real time providing all-around security and peace of mind to the millions of the customers all over the world. – Norton is an industry-standard software suite of antivirus programs and software utilities that sells its products under the name of Symantec Corporation – a global cyber security company and one of the world’s largest antivirus software vendors headquartered in Mountain View, California. Originally called Alwil, Avast is a leading cyber security company headquartered in Prague, Czech Republic. Avast, short for “AntiVirus Advanced Set”, incorporates advanced and next-generation security technologies to fight against cyber crimes in real time providing all-around security. Symantec is one of the most trusted names in the cyber security domain. – While both Norton and Avast offer freemium models absolutely free of cost with all the basic features and utilities for a certain period of time, you have to pay more for the premium models to enjoy advanced security features. The Norton Security Standard costs $39.99/first year for one device while the Avast Pro Antivirus costs $40 a year for a single-machine license. Norton Security Deluxe provides support for up to 5 devices and costs $49.99/first year while Avast costs $85/year for the same number of devices, but Avast reduces the per machine cost to $14 if you opt support for up to 10 devices. So, Norton’s software suites are less expensive than that of Avast’s. – Norton relatively provides better results in terms of system performance, as it consumes less system resources while causing no system lags and slow down whatsoever. Norton is a very lightweight program which puts a very less impact on the system, especially during scans. It provides comparatively better than the market average. Avast, on the other hand, is fairly heavy on the system owing to its advanced features and utilities which cause the system to slow down or cause interruptions during system scans or standard user actions such as browsing or downloading files. – Norton excels in malware protection and it provides complete protection to multiple devices at once, including smartphone and tablets. Norton is still one of the most trusted premium antivirus programs because of its large selection of advanced security features and flexible security solutions. Avast offers a wide range of security products to cater to individual users and businesses alike across multiple operating systems. However, Avast performs not so well in terms of antimalware effectiveness but uses the same signature-based detection system to detect and remove emerging threats. While both Norton and Avast are the two biggest names in the cyber security industry with a comprehensive feature set and a sizable portfolio of security products and utility programs, Norton is the most trusted name when it comes to malware protection and security effectiveness. Avast is not so bad either; it offers a generous, comprehensive set of features and utilities to provide the best all-around protection against the emerging threats. However, its malware detection and removal abilities are average. So, Norton is a clear winner in terms of malware protection. Sagar Khillar. "Difference Between Norton and Avast." DifferenceBetween.net. 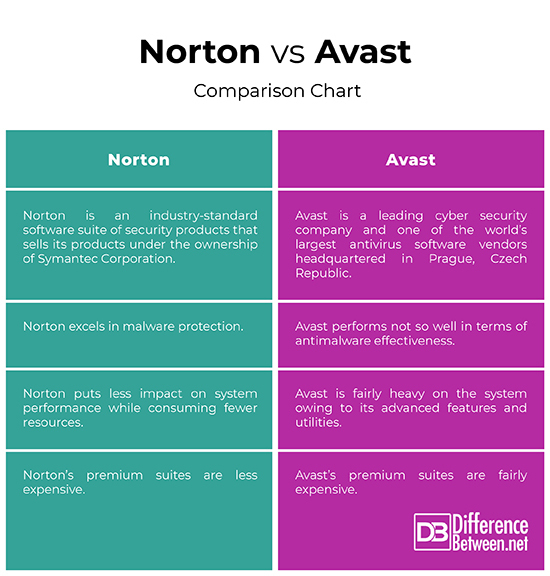 April 4, 2019 < http://www.differencebetween.net/technology/difference-between-norton-and-avast/ >.